The YMCA of San Francisco proudly presents our 5th Annual Iron Chef Competition and Fundraiser, benefiting Primed & Prepped, our hospitality management/culinary arts mentoring and job training program. Who will be the next Iron Chef Champions? Enjoy delicious food and lively fun, with a live showcase of the students' demonstrating their culinary skills as sous chefs to celebrity chefs who will compete for the title of Iron Chef! Primed & Prepped provides students with the tools to mitigate employment barriers and hone their leadership skills. 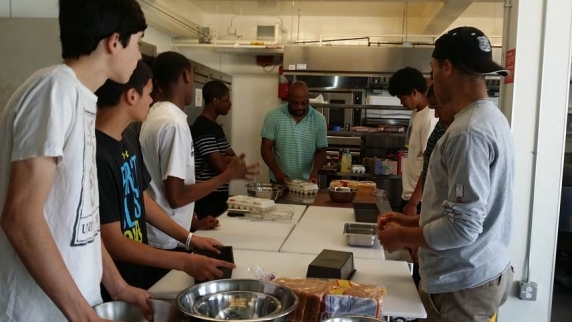 Focused on hospitality management and culinary arts, the program is designed to support youth of color, ages 14-19, to develop culinary skills and be placed in internships and jobs. Primed for Hospitality and Prepped for Life: A Evening with Former Mayor Willie Brown, Jr.
Demetrius' passion is shown by the many personal, professional, and economic opportunities created by his department each year.